This propellant has a burn rate and temperature sensitivity very similar to Hodgdon® VARGET. Temperature sensitivity, burn rate and propellant density closely track with the same characteristics of VARGET. However, our testing reveals that velocity variation at both ambient and extreme temperatures out-performs that of VARGET. This characteristic should benefit those seeking superior accuracy. Precision Rifle has a burn rate that permits use in a wide range of centerfire rifle cartridges. Despite Precision Rifle being an extruded propellant, we have found good flow characteristics through a volumetric powder dump. The grain is narrow, and cut short. 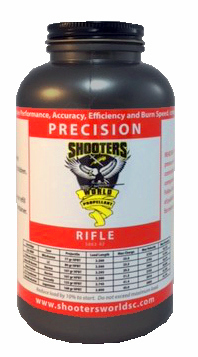 While some reloaders insist on weighing each powder charge, we did not find that extra time necessary when loading for accuracy with this propellant. Precision Rifle is a canister form of Explosia bulk and Lovex canister propellant S062. You can view ballistic load data for Precision Rifle using both SAAMI and European CIP test methods and standards.